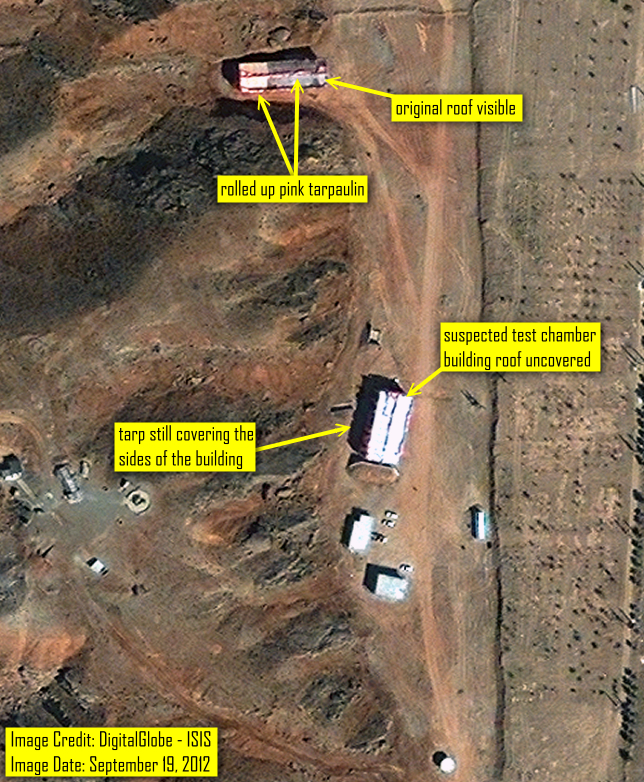 The latest imagery from the Parchin military complex in Iran, suspected to have housed nuclear weapons development related tests, shows a further phase of activity. Iran appears to be removing the tarpaulin covers placed earlier on two of the major buildings at the site (figure 1). 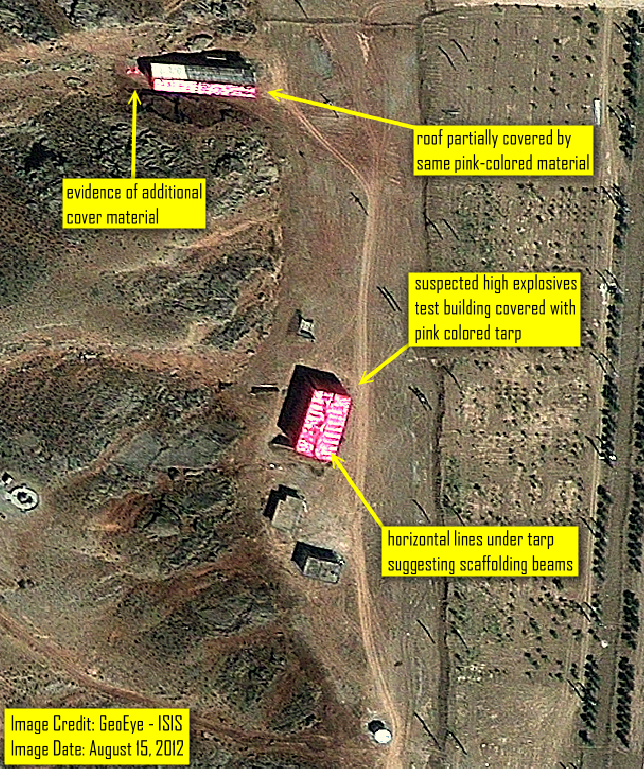 In previous ISIS imagery analyses, the suspected test chamber building could be seen entirely covered by a pink tarp while the building to its north had its roof only partially covered with signs indicating that it would eventually be entirely covered as well (figure 2). The IAEA may want to visit this northern building because it may be related to the experiments in the test chamber building. The latest commercial imagery from September 19, 2012 shows the roofs of both buildings previously covered no longer under tarps. By comparing the latest imagery with previous imagery from July 25 showing the buildings without covers (figure 3), in the case of the northern building, the pink tarpaulin appears rolled up on the roof. It is unclear if the sides of the northern building are still behind the cover. Part of the tarp on the building holding the suspected high explosive test chamber also appears to have been removed, revealing its roof. The building’s sides can still be seen to be behind the tarpaulin cover. Judging by the number of vehicles in the confines of the site, it appears that there is still considerable activity. It is difficult to fully determine the scope and nature of the ongoing activity. Alterations to the site for all intents and purposes have to be seen as cleanup operations with the intent to degrade or eliminate the IAEA’s ability to examine the site. It is increasingly difficult to believe that an IAEA visit will yield any significant breakthrough in the inspectors’ effort to find answers to questions about the military dimensions of Iran’s nuclear programs. The IAEA is legally justified to ask Iran for access to this site in order to fulfill its mandate. The question for the IAEA’s Director General and the Board of Governors is: what should now be done about Iran’s continued refusal of a legitimate request for access combined with its alterations of the site? 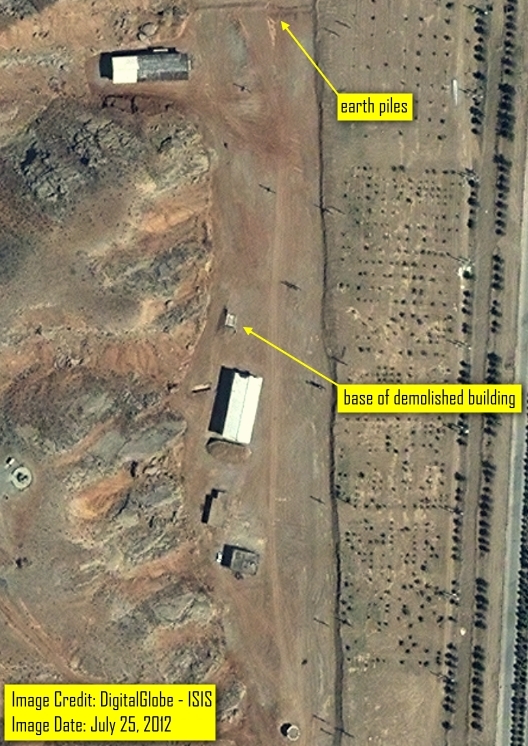 Figure 1: In the latest satellite imagery, the covers placed on the two major buildings at the Parchin site seem to be in the process of being removed. The original roofs of the two buildings are now visible, as are rolled up lines of pink tarpaulin. Figure 2: The image from August 15, 2012 shows the suspected high explosives test building to be completely covered with a pink tarpaulin while the building to its north is still in the process of being completely covered. Figure 3: Imagery from July 25, 2012 showing what appears to be the final phase of major demolition and earth moving activities that heavily altered the site over the course of four months. The original state of the roofs of the two buildings later covered with tarpaulin is clearly visible in this image.